As strong impulses strike the Earth’s magnetopause, the abrupt boundary between the planet’s magnetosphere and the surrounding plasma, ripples travel along its surface which then get reflected back when they approach the magnetic poles. The interference of the original and reflected waves leads to a standing wave pattern, in which specific points appear to be standing still while others vibrate back and forth. A drum resonates like this when struck in exactly the same way. A new study, published in the journal Nature Communications, describes the first time this effect has been observed after it was theoretically proposed 45 years ago. Illustration of a plasma jet impact (yellow) generating standing waves at the boundary (blue) of Earth’s magnetic shield (green). Image credit: E. Masongsong, UCLA / M. Archer, QMUL / H. Hietala, UTU. Inside the Earth’s magnetosphere, planetary researchers have long been listening in on space sounds created by various electromagnetic waves. This veritable orchestra of waves can be heard as sound when processed correctly, and they even exhibit similar behaviors to certain musical instruments. So-called magnetosonic waves pulse through plasma in the same way sound bounces through wind instruments. Another type of wave, known as an Alfvén wave, resonates along magnetic field lines, just like string instruments’ vibrating strings. While both of these types of waves can travel anywhere in space, the newly-discovered waves are a type of surface waves — waves that require some sort of boundary to travel along. In this case the magnetopause acted as the boundary. When a plasma jet — the drumstick — strikes the magnetopause, surface waves form a standing wave pattern — where the ends appear to be standing still while other points vibrate back and forth — just like a drumhead. The fixed points in the wave, which are the rim or edge of the drum, are near Earth’s magnetic poles; the waves vibrate the surface of the magnetopause in between. While the wave itself remains on the surface, the vibrations ultimately work their way down into the magnetosphere and trigger other types of waves. “The waves likely penetrate far into the inner magnetosphere causing ultra-low frequency waves, which affect things like radiation belts, the aurora, and even the ionosphere,” said lead author Dr. Martin Archer, space physicist at Queen Mary University, UK. Dr. Archer and colleagues used observations from five NASA’s Time History of Events and Macroscale Interactions during Substorms (THEMIS) satellites when they were ideally located as a strong isolated plasma jet slammed into the magnetopause. The probes were able to detect the boundary’s oscillations and the resulting sounds within the Earth’s magnetic shield, which agreed with the theory and gave the researchers the ability to rule out all other possible explanations. “Given the lack of evidence over the 45 years since they were proposed, there had been speculation that these drum-like vibrations might not occur at all,” Dr. Archer said. An upcoming NASA mission could look for signs of past ‘ferrovolcanism’ on asteroid Psyche. 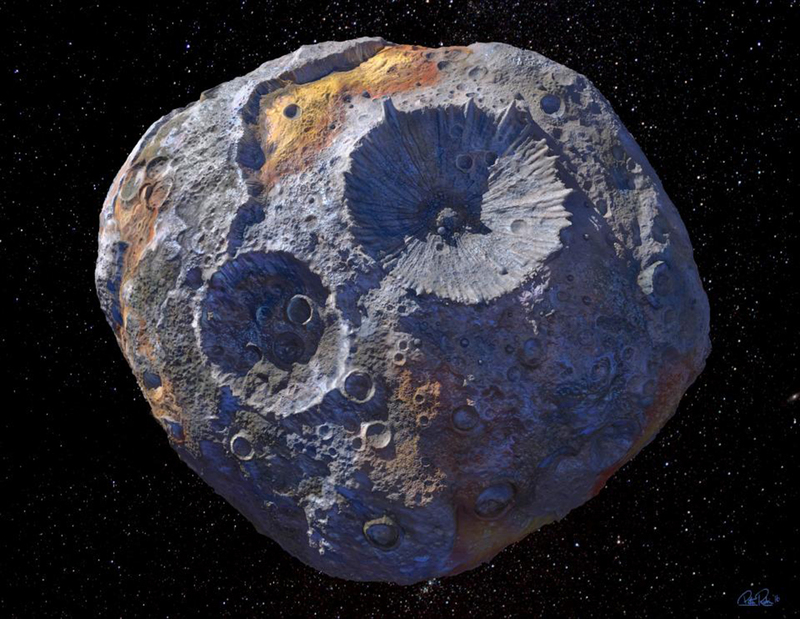 When NASA launches a probe to a metal asteroid called Psyche in 2022, planetary scientists will be able to search for signs of such volcanic activity in the object’s past. The new research “is the first time anyone has worked out what volcanism is likely to look like on these asteroids,” says planetary scientist Jacob Abrahams of the University of California, Santa Cruz. Another way that ferrovolcanism could have occurred on metal asteroids was described by planetary scientist Brandon Johnson of Brown University in Providence, R.I. If a cooling iron core also contained a little bit of rock and sulfur, he theorizes, the core could have been cocooned beneath a rocky, not iron, crust. As the core cooled further, pockets of iron-rich liquid with extra sulfur dissolved in them would have hardened more slowly than surrounding materials. Those pockets would be more buoyant than the rock above them, so they’d force their way up and out, Johnson says. Event Horizon Telescope data are giving scientists an image of the Milky Way’s behemoth. The Event Horizon Telescope, a network of eight radio observatories spanning the globe, has set its sights on a pair of behemoths: Sagittarius A*, the supermassive black hole at the Milky Way’s center, and an even more massive black hole 53.5 million light-years away in galaxy Messier 87 (SN Online: 4/5/17). CONSIDERING ALL POSSIBILITIES Physicists expect black holes to follow Einstein’s rules of general relativity, but it might be more interesting if they don’t. This computer simulation shows one possibility for how a black hole would look if it behaved unexpectedly. BLACK HOLE SUN Einstein’s theory of gravity was upheld in measurements of a star that recently made a close pass by the supermassive black hole at the center of the Milky Way, as shown in this artist’s conception illustrating the star’s trajectory over the past few months. EHT’s measurements of Messier 87’s black hole will help estimate the strength of its magnetic field, which astronomers think is related to the jet-launching mechanism. And measurements of the jet’s properties when it’s close to the black hole will help determine where the jet originates — in the innermost part of the accretion disk, farther out in the disk or from the black hole itself. Those observations might also reveal whether the jet is launched by something about the black hole itself or by the fast-flowing material in the accretion disk. Even after 110 years of digging in the Burgess Shale region, paleontologists are still turning up rich new sites and bizarre new creatures, adds Caron, of Canada’s Royal Ontario Museum. Just last summer, he and colleagues made new discoveries, including an enigmatic shield-shaped critter that he dubbed “the mothership.” Unlike other Cambrian fossil troves, the Qingjiang biota appears to contain a high proportion of jellyfish, or cnidarians, and comb jellies, also called ctenophores. These species, particularly the comb jellies, are extremely rare at other sites. Two glowing columns hundreds of light-years long extend from the center of the galaxy. DOUBLE BUBBLE Two enormous bubbles sandwich the Milky Way and emit gamma rays (illustrated). Two chimneys that glow in X-rays seem to connect these bubbles to the galaxy’s center, scientists report. NASA Goddard Space Flight Center. New observations with the European Space Agency’s XMM-Newton satellite uncovered the chimneys. The researchers “have done a fantastic job to demonstrate these very distinct features,” says astronomer Daniel Wang of the University of Massachusetts Amherst. Previously, hints of such structures have been found using Japan’s Suzaku X-ray satellite, he says. A couple years ago I met a guy who is the CEO of H2O.ai – which he said was an AI company. I’m surprised they weren’t on the list. Nine is a lot, don’t you think? I think a shake-out will come, as in U.S.A. presidential contenders lists. Subatomic particles born in the universe’s first second may imprint their effects on the sky. But neutrinos can shift that matter around due to the particles’ gravity, slightly changing the distribution of matter in the rings. “You’re seeing the pull of the neutrinos,” says cosmologist Daniel Green. Using data from the Baryon Oscillation Spectroscopic Survey, or BOSS, Green and colleagues studied the circular patterns of galaxies and saw evidence that the neutrinos were, in fact, pulling matter around from the inner side of the ring band toward the outer side. Scientists have previously spotted signs of the ancient neutrinos in a glow leftover from the Big Bang. The cosmic microwave background [CMB], light that was released when the universe was just 380,000 years old, is also affected by the cosmic neutrino background. But this is the first time evidence of the particles’ fingerprints on galaxies has been spotted. Tags: An element is defined by the number of protons it contains, At the far edge of the periodic table elements decay within instants of their formation offering very little time to study their properties, Basic Research ( 10,460 ), Chemistry ( 430 ), Each element comes in a variety of types known as isotopes distinguished by the number of neutrons in the nucleus, For superheavy atoms chemistry gets weird, Periodic Table ( 4 ), Science News, Scientists are hoping to stretch the periodic table even further beyond tennessine and three other recently discovered elements (113 115 and 118) that completed the table’s seventh row. For superheavy atoms, chemistry gets weird. In Russia, scientist Vladislav Shchegolev inspects a package of berkelium after its overseas flight in 2009. The material was later used to create element 117, tennessine. REVOLUTIONARY Russian chemist Dmitrii Mendeleev (shown around 1880) was the first to publish a periodic table, which put the known elements into a logical order and left room for elements not yet discovered. Heritage Image Partnership Ltd/Alamy Stock Photo. Scientists in Russia have built a new accelerator facility, the Superheavy Element Factory, to search for elements 119 and 120. JINR. Jacklyn Gates and Ken Gregorich of the FIONA experiment at Lawrence Berkeley National Laboratory made the first measurements of the masses of recently discovered elements 113 and 115. *According to a statement via email from LLNL, 113, was first found at LLNL; but on 113, Riken published first and so got the credit.